Enclosed between the double handle of the Adige River on one side and the hills in the background on the other, Verona is one of the most tourist and cultural destinations of Veneto. The city’s evolution started during the most important eras of Italian history: its geographical position allowed it to develop a fundamental role from Roman times to the Renaissance, running up to modern commercial times. During the Roman era Verona enjoyed its importance and prosperity, and even today, the remains of that glorious moment, make the city famous: The Arena, the Roman Theatre, The Borsari Entrance, l’Arco dei Gavi (Arch). Successively, the city knew another important moment throughout the medieval times: it was the seat of King Barbari, and then, between the 12th and 14th centuries became a Free Council before passing under the Rule of the Scaligeri. During this phase, some of the most important monuments of the city were erected: The Churches of S. Zeno Maggiore, S. Anastasia and S. Fermo, Castelvecchio, the Scaligere Arches. From 1404 to the end of 1796, Verona passed under the Venetian administration, was fortified with walls and was utilized by famous artists. 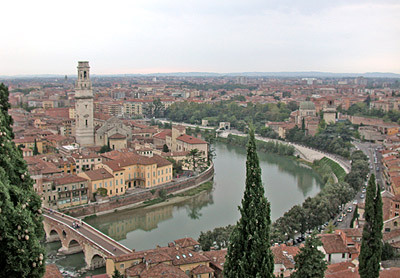 Verona also underwent urban transformation under the Austrian dominion, of which clear examples can be seen through the display of the new walls and reclamation of the area known of as Dead Water. Today, the city is a lively centre, rich in colour and picturesque glimpses and also rich in the intense cultural life – the periodic exhibitions are always of high standard and are held in the Gallery of Modern Art in Palazzo Forti building, the Lyrical Summer season in the Arena, the musical season of the Philharmonic Teatre, the prose at the Roman Theatre, the Museum near the Castelvecchio (old castle) – sports – and the centre of championships, including world, for example in Cycling – let alone economic – thanks to the multiple activities of the Fairs, including the most renown manifestations of Vinitaly (Italian Wine Festival), Fieracavalli and Marmomac. Piazza Bra is the centre of the city – the name comes from the fact that once upon a time, it was a suburban square, the “braida” – and is characterized by the building, symbol of the city, the Arena, one of the main surviving Roman amphitheatres dating back to the 1st Century A.D. In the square, the neo-classic Palazzo Municipale, the Gran Guardia sit side by side, today you can see interesting and modern museale arches of the old Portoni della Bra, which date back to 1389. On the arcaded side of the square is where the so called Liston begins; the walk that follows ideally through via Mazzini, the buzzing centre of public life in Verona. Verona hotels guide to choose your hotel, B&B and apartment in Venice by location, fee or category: secure bookings.